Has your computer or Android phone switched off automatically without any specific reason? When working on your computer or using the Android phone turns itself off automatically? Lot of time most of the user face this kind of situation in his laptop, desktop computer or Android phone. It will be frustrating and you didn’t understand what is the issue of this problem. 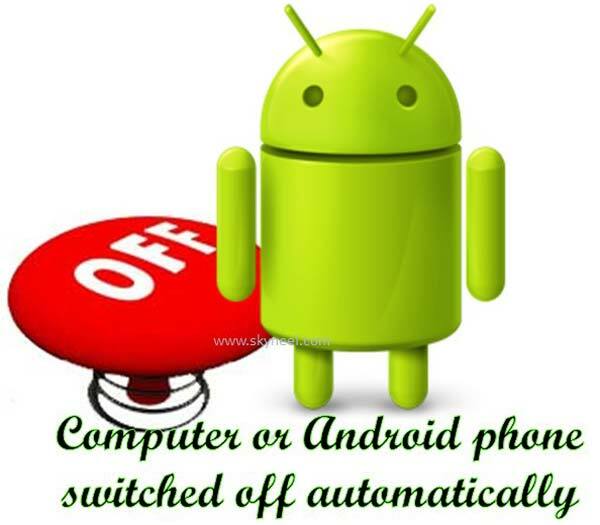 This article helps you to get the proper solution what to do when computer or Android phone switched off automatically. There are different reasons due to which your computer or Android phone switched off automatically. Have a look few top reasons due to which you have to face this type of issues. This article helps you to easily get the proper solution to fix this type issue on your computer or Android phone. Sometime you see after installing any app your Android phone is not working properly. Lot of time your phone switched off automatically randomly or not function properly. Lot of apps does not work properly on your Android phone. Sometime you will get a notification message during installing or turn off your computer or Android phone. First you have to read carefully the warning message box otherwise immediately remove or uninstall the app from your computer or Android phone. After removing the app reboot your device and check your problem is fixes or not. If yes then you have to start working on your computer or Android phone. There are a lot of electronic gadgets like Android phone, computer, laptop etc. infected with overheating problem due to which your computer or Android phone switched off automatically. You have to use cooling kit for your computer or laptop or any other devices to solve overheating problem. You have to also proper check all the cable, battery status of your Android phone. Android overheating problem in another important cause to switchoff your phone automatically. Overheating problem also generate during playing games, watching movies, talk to someone, listing music from long period. You have to immediately turn off all these things and switched off your computer or Android phone for few time. You can also keep your device at normal or cool temperature. Step 1. Dial given specific code on your dialer pad *#*#4636#*#*. After dialling this code on your phone dialer it will show you “Testing” window. Step 2: Tap on the “Battery Information” in the “Testing” window. It will show you battery status, power plug, battery level, scale, health, voltage, temperature and many more. If your battery health is not at “Good” level then immediately replace your phone battery. You have to replace old battery with original new phone battery. After that your Android phone switched off automatically problem will be resolved. All we know virus play an important role to corrupt any electronic gadgets like computer, laptop or Android phone. If any virus enter in your computer system or Android phone, it will corrupt all the important files due to which your electronic device not working properly. If you want to fix that type of problem then you have to install with any registered antivirus in your device. Now, you have to complete scan your electronic device with your Antivirus software. It will start scanning process and after that either it will remove or give quadrant virus infected files. After finish scanning process your computer or Android phone switched off automatically problem solved. Sometime if your computer, laptop does not get proper power supply due to which these device’s turn-off automatically. If you want to fix them then you have to first check the power cable of your system and after that check power board. If your power board or power cable is not working proper then immediately change the charge place or replace the power cable with new one. Sometime power button of electronic gadgets is not working properly in that situation you have to check your device with professional technician. If your electronic gadgets running on an old operating system or version then it is another main cause your computer or Android phone switched off automatically. If you want to fix that problem then you have to update or install new operating system on your computer system or laptop. You can also check and system updates on your Android phone. If you get any system update then immediately upgrade your Android phone. Step 1: Tap on the “Settings” on your Android phone. Step 2: Tap on the “About phone” which is located in the “System” category. Step 3: Tap on the “System updates”. Now, tap on the “check for updates”. If your mobile manufacturing company provide any system updates then updates process is start on your Android phone. It will take some time to update your Android phone after finish the updates process you have to again reboot your phone. Now, you will get your phone will be must faster and automatically switched off problem resolved. Note: You have to always take backup of your Android phone. If your problem not solved then you have single way to format your Android phone. You must have to take complete backup of your phone before starting formatting process. If you have complete backup of your Android phone then you have to start “factory data reset” process. It will erase all data from your phone and when your phone will reboot again your automatically switched off problem is fixed. If any case your problem is not resolved then immediately take your Android device at authorised service centre. I hope after reading what to do when computer or Android phone switched off automatically article, lot of Android phone user will problem will be resolved. If you have any suggestion regarding this article then write us in the comment box. Thanks to all.